My team and I worked together for years to create and consistently publish original content bylined by me as a thought leader to a variety of publications. Since we had used content to build meaningful connections with our audience and drive our company this far, we thought about what kind of impact a book guided by that same strategy could make on our content marketing goals. That’s when the idea to write Top of Mind was born. Developed a solid foundation: A robust content marketing strategy that’s driven results is the foundation for a book. You have an established set of goals and have created a body of published work that relies on your expertise that your audience finds valuable. A book is your company’s chance to dive deeper and strengthen that connection. Created a trusted network and influence in your space: Unless you’re publishing content to a private blog that acts more like your secret diary than a tool for your marketing, your company’s content is getting into the hands of people who find it valuable. When you actively distribute content that delivers value to your audience, your brand builds a network of advocates and influencers whom you can tap when it’s time to write, publish, and promote your company’s book. Tested the process: You have experience in – and a proven process for – content creation. You know your own strengths and weaknesses, and your team has shown it has the know-how to produce high-quality, engaging work that benefits your company. Though you have that foundation, that isn’t to say that you can directly apply your content marketing strategy and processes for your standard blog posts or white papers to the creation of an original full-length book. Yes, your strategy and experiences in content marketing are helpful, but writing a book comes with its own set of challenges. Consider the longest piece of content you’ve ever written; for many, that’s a white paper, research report, or something similar. I bet it clocks in between 2,500 and 4,000 words, and I’m sure ideating, writing, and editing that content took a lot of time. A book, on the other hand, can easily land in the 50,000-word ballpark and beyond, and you could be looking at anywhere from a six-month timeline for shorter books to a year or more for longer ones. Not only does a project of that scale take time, but it can soak up a lot of your energy and focus. It demands long-term thinking, strategy, and dedication to your end goal that more agile short-form content simply doesn’t require as strongly. The goals behind your book are likely the same that drive your day-to-day content marketing strategy: increased opportunity, brand awareness, thought leadership, audience engagement, and more. Just as those goals give your published content a sense of direction, they also should shape your book and focus its scope. A book gives a unique opportunity to go deeper and expand on the concepts that earned your audience’s trust in the first place. Look at your previous content to see which articles, videos, infographics, white papers, etc., have received the best responses and generated the most substantial returns. This gives you an idea of which topics your audience members enjoy and want more of, and it lets you home in on those key areas to outline the book’s overall theme and specific chapters. My book was a labor of love – not just for me, but also for my marketing team and the freelance writer we worked with. Each person on the team outlined the ideas, polished the writing, sharpened the content’s presentation, and helped ensure that the edited book’s content was set up to meet the goals we set. No one person could possibly have managed it all on his own. A team of experts is necessary. 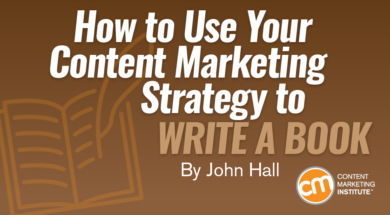 Start by examining your content creation process and adapt it to a longer project like a book. Obviously, the time frame is different, but many of the general responsibilities and tasks are similar. Identify your teammates’ capacity to handle a long-term initiative and leverage their expertise to execute it. By the time you use your content marketing experience to take the next step and write a book for your company, you (hopefully) have built a strong, engaged audience and a roster of valuable industry contacts and influencers. Let them know what you’re up to. Tell them what you’re working on, share the content when you can, and invite them to give input. They might shed light on a new way of looking at something or push back on some of your ideas, both of which will force you to improve your content. After they’ve helped you write it, they may be willing to help you promote it or even endorse it. Don’t be afraid to ask for important introductions, either. Your brand advocates, partners, and industry peers all have their own contacts – and if you land an introduction, they can connect you with agencies, publishers, and other influencers who will help your published book succeed. The benefits of writing a book extend far beyond its initial publication. A positive reception could lead to increased industry authority, speaking engagements, fuel for future content projects, and new opportunities for your company. As a marketer with an effective content marketing strategy, you’ve already established that your brand’s ideas have merit. It’s now time to take those concepts further by turning them into a book. Make sure your content marketing strategy implementation always improves – whether you write a book or learn from CMI’s daily newsletter. (It’s easier to start reading the newsletter.) Subscribe today.